Could we regulate Social Media by creating a Global / National Social Media ID? The use of social media channels and platforms is increasing at a very rapid rate. Not only consumers are spending a lot of time on social networks, but brands are also spending time and figuring our social media strategy & approaches to connect with consumers online and build social business models. There are a number of challenges which are currently limiting the growth of Social Business models and as a digital marketer I wish to propose a global solution for the same. 1) No control on creating multiple accounts on any social network: There are currently no control on creating multiple user profile on social media platforms by any unique individual. This initiates the problems on fake online and social identity and is the root cause of a number of other issues. 2) Fake/Inactive User profiles at leading social networks: in the race of getting ahead with the rival social media networks, we feel that X% of any social media network account is fake/inactive account. The only advantage of the same is to fudge user base numbers. If someone has to deep down on this I believe you could find vendors in your country / city which sell you Facebook Fans at a cost. 3) Lack of Global regulations: There are no defined global regulations on what is being said, done and transacted on social media platforms apart from country specific cyber/IT laws which have a limited say in the entire process. Also these networks and communities refer and serve the need of different type of consumers so that is why I believe there has never been a thought to regulate or bring in some regulations. 4) Social media lead crimes/ impersonation and abuse is on the rise: Every now and then we keep on hearing stories that this is a social media lead crime and abuse. Apart from direct crimes, some of the social networks has been slammed to be contributing to low moral values in the society and even leading to adultery and divorces. Could the law enforcement agencies not work with the leading social media platforms to create a process where they put checks and balances on creating multiple accounts, deleting inactive / fake accounts at regular intervals, could agree upon a common rules and regulations which would even bind the platforms responsible along with users and help and inform the law enforcement agencies on regular basis by reporting and submitting the list of the potential risk based social media profiles on their platforms which have been identified as either potential threat to national security or having a high probability of getting indulged in social crimes. Some of these activities if implemented could be part of these social platforms annual return as their responsibility towards the society at large. Going beyond the negative aspects, if one has to leverage upon the availability of genuine users and buyers on the social media and when we know that both brands and customers are available. Could we think of creating a Global / National level Social Media ID which is linked to your social security number and combines and lists all of your social profiles in a single database? 1) National/global law enforcement agencies would create a database of allotting a national/global social ids to it’s citizen. Anyone at any age can apply and get a unique Id by submitting basic users details like first name, last name, city, DOB, Primary email id, secondary email id, gender, marital status, anniversary etc. This is a onetime step for all existing and new social media users. 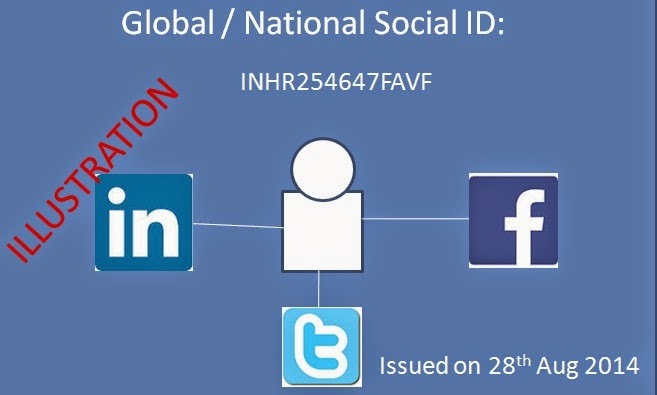 2) All the social platforms have to be ready to accept a new additional database field – National / Global Social Id and make specific changes in the user profile to be able to show national / global social id as a badge or any other form. 3) Any internet user who wishes to be a part of any social network for the first time has to first get his national / Global social id created and activated. 4) He could then join any social network by validating his social id and as and when he keeps on joining new networks, he keeps on referring the same national / global social id. 5) It’s the responsibility of any social platform to allow/disallow a user basis fake id or if the ID is being used already by any other users. 6) So whenever a user joins a new social network, this id has to be mentioned and this way it can be linked to your previous social media history. This if becomes possible and even if implemented in small steps world’s top three social media platforms – Facebook, Twitter and Linkedin could help us address a lot of concerns in taking social CRM, Social Payments and Social Commerce to next level as we would have a process to validate a social profiles identity and one can map a social 360 degree view of a user. This does not stop here. If you link this global / national social id to your bank accounts, passports, credit cards, social virtual money, PAN cards we could make the dream of social business model possible. The idea came to my mind and I thought of writing a blog post and sharing with the entire world. The bottom line fact is social media, to my mind, is a publicly accessible media, available to all, co-created and universally available and has already been responsible for a large number of massive global movements in various parts of the world. In all the cases users saying, liking or spreading a particular news/image are responsible themselves and no one else. So for what sake we can leave it un-monitored and unregulated when all other forms of media are heavily regulated? Do please let me know what you think?